Sometimes works of art that don't go over very well on paper are fantastic in actuality. In the absence of being able to make something sound appealing in the marketing materials, the tricky thing is getting audiences to see past the "product description" and make the leap of faith to buy a ticket. Such is the case with regards to Clementine in the Lower 9, a play by Dan Dietz with music by Justin Ellington, which is currently receiving a world premiere run under the auspices of Theatreworks at The Mountain View Center for the Performing Arts. I wasn't all that turned on by the idea of the production. But I went along to see the show anyway over the weekend and was completely riveted. The play seems like it might be didactic and pretentious from the marketing materials: it's a work that uses Aeschylus' Agamemnon as a prism through which to explore life in the largely obliterated Lower Ninth Ward of New Orleans in the aftermath of Hurricane Katrina. Oh, and with some live blues music thrown in for "entertainment value." Yet despite the unpalatable advertising, Clementine in the Lower 9 is moving, multi-faceted and at times witty. 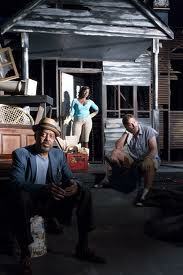 Set in the post-Hurricane ruins of the New Orleans home of Clementine, a hardworking former hospital nurse (who before she became a nurse was a jazz pianist), the play uses the metaphor of the hurricane as a way to explore human turmoil as it plays out in the external world as well as internally, inside the characters' hearts and minds. Dietz has a strong ear for the rhythm of blues and constructs conversations that are as musical as they are quotidian. The relationship between the live four piece band, headed by the excellent pianist-singer-actor Kenny Brawner who doubles up as bandleader and the play's Chorus, and the action on stage, is seamless. As in a Greek tragedy, music and drama / pleasure and pain, are different sides of the same dramaturgical coin. Over the course of this intelligent drama, we learn about the limits of human agency and about the constant struggle between accepting one's fate, and fighting tooth and nail against the status quo. If the story ventures dangerously into ax-wielding melodrama towards the end, there's enough control in the storytelling, direction and acting to keep things just this side of over-the-top. Only the set design, with its horizontal, quasi-naturalistic realization of Clementine's house, feels over-labored: The cast wastes considerable time and energy clanking about between rooms, slackening the otherwise taut thread of the action. I hope that Clementine in the Lower 9, which has a touch of Tony Kushner's Caroline, Or Change in it, goes on to great things beyond the current great run in Mountain View. Hey, this such a nice tv series, i guess it will be like Dr. House or so, also i found more about this series here https://wacom.ccnsite.com/gallery/30099625/Why-Boston-for-Graphic-Design-Study-Heres-Why Please keep update your blog.